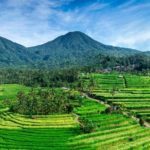 A wonderful day to bring you to the nearest aspects of the Balinese culture, the Traditional dances, handcrafts village,the landscapes of the rice fields, and temple of sacred spring water in a green valley, the Balinese food and spectacular volcano. Special 2 days tour a round Bali. One night in the north part of Bali see the Dolphin. In two days you can see all points the of interest in Bali.